If you are searching for carpenter ant information, it is quite likely that you either feel as if you may have an infestation of these pests, or, you have actually been told that you do have a carpenter ant infestation. Either way, it is in your best interest to learn as much as you possibly can about these types of ants as they have the potential to cause an immense amount of damage in and around your home. Carpenter ants are exceptionally large social insects that are black or a reddish-colored black. These insects have unique castes of various “workers” that perform different jobs within the colony. If you feel as if you have an infestation, you have likely observed the “workers” and/or the “swarmers”, which are ants with wings. In this guide, you will be provided with detailed information pertaining to carpenter ants and the steps that you may take to successfully combat an infestation. Identifying carpenter ants may prove to be a challenging endeavor given the fact that there are 24 different species within the United States. The size and the color may vary greatly among the different species. In general, these types of ants measure from 3.4 mm to 13 mm in length. The coloration is typically black or reddish-black; however, there are those that are brown, yellow, and/or orange in color. While these are considered to be the largest species of ants in the world, it has been established that size is not the most reliable factor in their identification due to the fact that the workers that are part of a carpenter ant species most often vary in size. 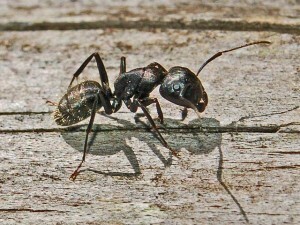 The most reliable characteristics in identifying carpenter ants is the elbowed antennae, the constricted waist, and – if wings are present – the front pair of wings is longer than the back pair. In reviewing carpenter ant information, you will find that the largest hazard is that they have the capability of destroying wood by creating tunnels within the wood that they infest so that they may reside within it. In most instances, extensive damage is done before the ants are identified. The colonies of these ants grow at an exceptionally slow rate. As a result, the damage to the wood that they infest is done slowly. If you see one carpenter ant, you can be certain that there are more. You should immediately work to eliminate the infestation. Despite popular belief, carpenter ants do not eat food. They simply build their nests in wood. In reviewing carpenter ant information, you will find that the insects primarily feed on insects, honeydew produced by other insects, and juices derived from a large variety of plants. Additionally, the carpenter ant is attracted to sweets, meats, and even grease. If you are attempting to eliminate an infestation, it is important that you remove any and all food sources; however, keep in mind that professional pest control services will likely be required due to the fact that worker ants and the queen within the colony may engage in eating their own kind, if it is necessary for survival. If you need assistance in combatting a carpenter ant infestation, contact All Pest Exterminating Inc. today at 888-802-5777.